FIWUF is sending a team to participitate and compete in the event. The team leader is Shifu Zhang Fang and team has seven people from Helsinki and Oulu. More information about the Games from the Belgian Health Qigong Federation homepage. Seminar was held in Sichuan province China at 21th to 27th February 2014. From Finnish Wushu Federation Qigong Branch there were Chairman Shifu Zhang Fang and his assistant Aki Korhonen. Shifu Zhang Fang got an Honorary 4th Duan of Health Qigong. Aki Korhonen and Heikki Pesu got 2nd duan of Health Qigong certificates from the graduation in Porto, Portugal 10/2013. Report in the Federation blog. International Health Qigong Association organized a seminar for European instructors in Porto, Portugal. There were lectures and teaching of the routines: Shi Er Duan Jin, Dao Yin Yang Sheng Gong Shi Er Fa, Liu Zi Jue and Taiji Yang Sheng Zhang. From Finnish Wushu Federation there were three participitants, Shifu Zhang Fang, Chairman of the FIWUF, Aki Korhonen and Heikki Pesu. Finnish Wushu Federation 芬兰武术联合会 board and member clubs has decided to found Health Qigong Branch 3.8.2013. The official name is "Finnish Wushu Federation Health Qigong Branch - 芬兰武术联合会健身气功分会". In June 2013 (16.-30.6.) 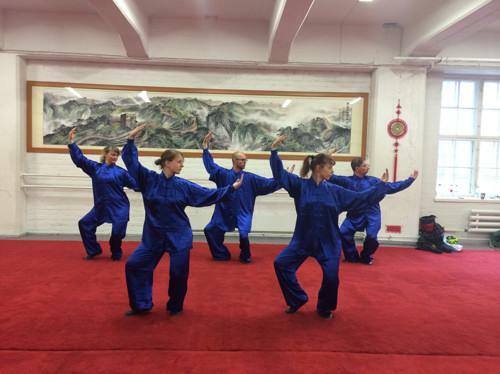 Finnish Wushu Federation was invited by professor Shi Ai Qiao and Wuhan Sports University to practice Health Qigong in Wuhan, China. There were 30 persons visiting from Finnish Wushu Federation member clubs and the main focus was in learning Health Qigong Wu Qin Xi. Also other routines got detailed instruction from the professor Shí Ài Qiáo 石爱桥 and teachers Léi Bīn 雷斌 and Fàn Xué Fēng 范学峰 . The trip was very successful and pleasant in every aspect and everybody returned to Finland with smile in their face! The Finnish Wushu Federation Health Qigong Branch has already started to make preparations to invite teacher Fàn Xué Fēng to teach Health Qigong in Finland in autumn 2014.